← Please, Let Me Give You Money! We happened upon the London Transport Museum one sunny afternoon in search of air conditioning. What we found was so much more: loads of history on all forms of transportation, in a compact museum nestled among Covent Garden’s outdoor cafes, shops and street performers. I thought I knew quite a bit about London’s tubes, busses and tramlinks, as it is our primary mode of transport, not owning a car. Now knowing the history makes it even more fun to jump on the bus! In 1800, most Londoners didn’t live beyond walking distance of their work, shops, and churches. Everybody walked. The first real mode of public transport became known as the Hackney Carriage, a horse drawn carriage from the Hackney area that would be hired out for travel between London and outside the city limits, solely by the wealthy. 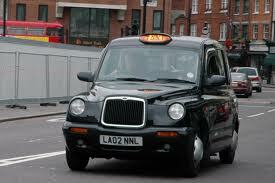 The name stuck, as Hackney Carriage remains the official name of London’s “black cab” today. With the railway boom of the 1830s-1840s, all modes of transport were leading to London, creating busy and dangerous roadways. A solution was proposed in 1860’s: an underground railway system. Construction began with the “cut and cover” method: shallow ditches were dug, then roofed over to create the tunnel. By 1884, three underground lines were up and running. While this was an amazing technical accomplishment, using steam trains underground created quite an odor and haze. As described in a Times Editorial, the stench while riding the Underground was a “form of mild torture that no person would undergo if he could conveniently help it.” By the early 1900s eight core underground lines were operational, and not until the 1960s was capacity increased with the addition of the Victoria Line. Today, the 13 lines of the London Underground carry approximately 3 million people daily, and if you squint you can probably see all 13 on the map, right. Another advent around the birth of the “tube” was the tramway, better described as a horse tram, as early as the 1850s in Britain, following the 1830’s example in New York and New Orleans. George Francis Train gets credit for these, and in 1870 tramways became the first mode of transport that most Londoners could afford to use. In the 1890s, many other cities had electric tramways and taxis, but by 1900, London was still using 50,000 horses to pull passengers from one corner of London to the other. For one vehicle to operate for one day, six horse changes were required, or 12 per vehicle per day. But London finally got on board and by 1915 most transport was by auto or electric. In 1929 George Shillibeer invented the first “omnibus,” from the Latin, meaning “for all” for local transport of passengers within London. It was not cheap but it was less expensive than hiring a stagecoach. It was also the first time customers didn’t have to book in advance and could pay the conductor directly as they boarded. The first route was from what is now Paddington Station to Bank Station. Busses quickly became more popular than trams as they were more comfortable and also easier to maintain. 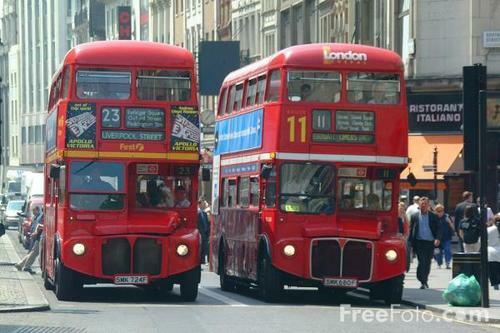 The famous red Routemaster bus, pictured here, from 1959, still runs two routes in central London, and you can usually catch it near Trafalgar Square. Today, with two children and no car, we typically go on “nap” rides on the bus when we all need a break…a great and cheap way to see the city!